My girlfriend and I were in Peru in August 2018, looking for experienced maestros we could trust to do private ceremonies with. Having read and listened to many reports of ‘bad’ shamans; we were understandably tentative as to whom to sit with. Good fortune and word of mouth led us to Safah and Felix. Words do indeed damage the truth when it comes to expressing how grateful we are for the 6 ceremonies we did with these two remarkable beings. From our first meeting at their house, to the tearful goodbyes; we felt safe, well held and cared for…priceless when it comes to doing such profound healing work. The healing we received from the medicine, the incredible Ikaros and their loving hearts is still palpable two months later…..something we know that will be with us the rest of our lives. Eternal gratitude to you Safah and Felix, it is with joy that I write this testimonial, knowing that if my words can help you and your joyous cause of helping to heal others, then they’re words well spent. Felix and Safah couldn't have been a more perfect set of hosts for our first ayahuasca ceremony. My partner and I sat for three nights, with one day to rest in the middle of the retreat. We were both astounded by their dedication to the plants, their integrity to the tradition they come from, and to the intention that went into each of our unique journeys. The hammock by the running brook is a great spot for diving into a book and relaxing. The evenings we sat in ceremony were powerful, guided through song and smoke, but the healing went beyond just those moments. Throughout each day, we learned countless other techniques, working with plants through such things as vapor baths and flower remedies. As a plant enthusiast, I was constantly wowed by the knowledge these two have around both their beloved jungle plants, and the mountain plants of their current abode. Their home is a retreat in an of itself; we were comfortable and immediately felt welcome in the space. Nestled at the base of some of the Valley's most sacred mountains, their place is quiet and homey, with high ceilings and natural light streaming in, it truly feels like a pace to unwind and do the work within yourself. They cooked us amazing meals every day - they've searched out the bakers and the farmers in their community, and the food they prepare is the perfect nourishment for the experience. Fresh fruit, chicken burgers, and sourdough bread, you can feel the love that's extended into the food. I couldn't recommend Mana Rao more as a place to unwind, breathe deep, and peel back the layers of conditioning we are all too often confronted with. The foundation of support I feel after this experience is beyond words; this place is only the beginning of the journey. Despacho offering ceremony to the spirits with our teacher Wilma. Inside their walls, Safah and Felix have created an environment that feels like a home away from home. The space invites you to dive inward in a comfortable and supported way that feels entirely natural, rather than forced in any way. Their dedication and passion for their work is radiant and inspiring. Each of them provides a different and complementing energy that consistently makes you feel safe and supported. I have been in awe of how hard these two will work to heal another person whom they have just met, and how much they genuinely care. I count myself blessed and fortunate to have come here when I did, Safah and Felix are incredible teachers and amazing healers, and I’m so happy to now call them family. Also, if you’re really lucky they will sing you the most beautiful song in the world and blow your mind. The minute I arrived at Safah and Felix's I knew I'd come to the right place, I was welcomed in like family and felt at home instantly. I had drank Ayahuasca several times previously but here I was able to drop way deeper into the experience than I ever had before because of how safely the space was held. Their relationship with the plants is beautiful and aligned and they are truly in service to all the green beings. The house, the garden and mountains provide the perfect, peaceful environment for this work and the food is awesome! I feel so lucky to have found this place and know I'll return time and time again. Thank you so much Safah and Felix. I arrived at Felix and Safah’s extremely nervous and emotional about my first ahyausca sitting. Within an hour I was totally at ease, reassured and full of trust that I was in the safest hands. My experience has been life changing and I feel so lucky to have sat my first two ahyausca ceremonies with them. I couldn’t have wished for a better experience. Their amazing talent, professionalism and kindness is unparalleled and I cannot thank them enough. I look forward to returning! How do you describe an experience like this, when no name, word or price can sum it up?! 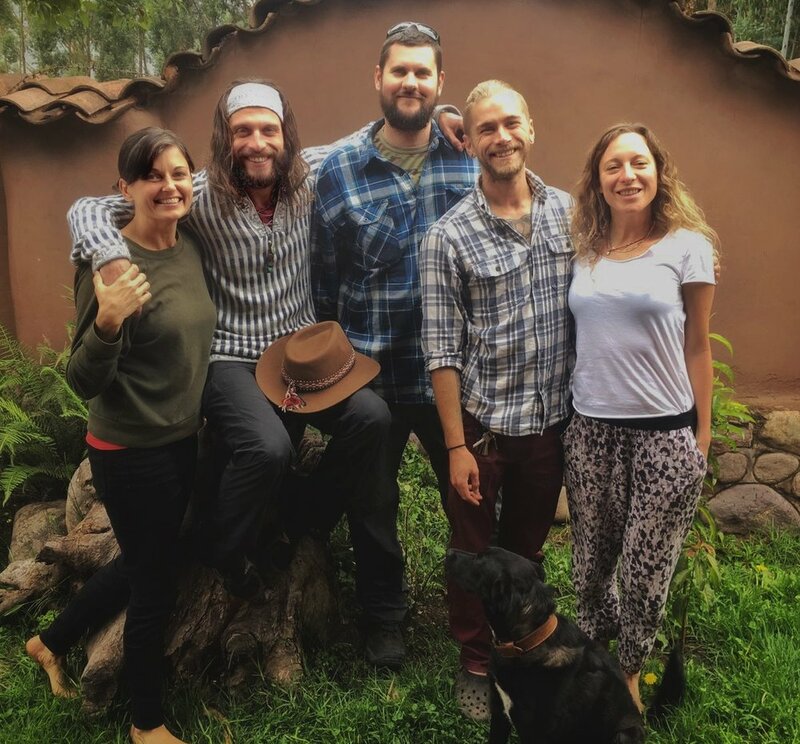 What Safah and Felix are providing isn't another plant medicine 'retreat', it's their own offering of the Ayahuasca experience, and it's given to everyone, individually, and with love. They have created a sacred space from which you can safely explore the medicine, and go as deep into the experience as you feel you want to take yourself. Their beautiful home is set in idyllic and sacred land with mountains and waterfalls on your doorstep, so you wake up every day smiling, and in paradise. I can't imagine a safer and more loving place to meet the medicine, and more attentive and caring people to go on that journey with. There is no one I wouldn't recommend this adventure to. It's a once in a lifetime experience... but I can't wait to come back! Thank you guys, with all my heart.